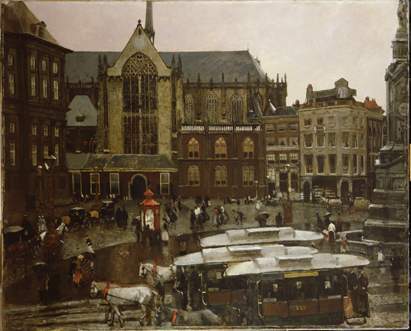 George Hendrik Breitner – De Dam, 1898. Collection Amsterdam Museum, on loan from Stedelijk Museum. Printed with permission. In 2013, the Amsterdam Museum presented The Sound of Amsterdam, an interactive installation that allowed visitors to explore historical changes in the sounds of Amsterdam city. The installation’s simulation software enabled visitors to experience the sounds as they had been audible on Dam Square, Amsterdam’s main square, in 1895, 1935 and 2012. Museum visitors could also listen to stories on how city dwellers coped with noise and silence in these years, and how the urban soundscape changed during World War II. FASoS Professor Karin Bijsterveld initiated this unique installation together with Annemarie de Wildt, curator at the Amsterdam Museum. Annelies Jacobs was involved in the historical research for this project, and Alexandra Supper in the communication between the American acoustic consultancy firm HMMH, the Amsterdam Museum, sound recordist Arnoud Traa and students. The installation resulted from the research project ‘Soundscapes of the Urban Past: Staged Sound as Mediated Cultural Heritage’, funded by the Netherlands Organization for Scientific Research (NWO). The project attracted wide press interest, and its binaurally recorded sounds of historical artefacts were subsequently used in other settings, such as the VPRO-NTR television series on the nineteenth century (De IJzeren Eeuw). The outreach project not only drew on academic publications but also resulted in new ones. Karin Bijsterveld was invited to edit a special issue on the use of sound in public history for the American journal The Public Historian (2015), and co-authored an article in Noise Control Engineering Journal (2014) drawing on the recordings of a 1930s car made for the project. This article was then taken up by the national press again. She was also asked to advise the Science Museum London on a future exhibition on sound. • Karel Knip, “Niks romantisch aan die jakkerende koetsjes,” Alledaagse Wetenschap, NRC Weekend, February 28, W6. • Bijsterveld, K. (Ed.) (2013). Soundscapes of the Urban Past: Staged Sound as Mediated Cultural Heritage (Sound Studies Series No. 5). Bielefeld: Transcript Verlag.